The idea that meditation is good for you is certainly not new, but scientists are still trying to figure out exactly why meditating so reliably improves mental and physical health. One old theory is that meditation is just like exercise: it trains the brain as if gray matter were a bundle of muscles. You work those muscles and they get stronger. A recent paper in the journal Psychological Science tries to identify brain functions that are actually enhanced by meditating. The study shows that intensive meditation can help people focus their attention and sustain it  even during the most boring of tasks. But while participants who meditated were able to pick up visual cues better than a control group, it was not clear whether meditating helped them process the new information in a meaningful way. The study, which was authored by 13 researchers and led by Katherine MacLean of the University of California, Davis, begins by noting that everyone gets tired after concentrating. It also notes that research going back to the 1970s has established that Buddhist monks who have regularly meditated for years perform better than most of us on concentration tests. In the past five years, other studies have shown that meditation also yields substantial gains in concentration for laypeople who take up the practice. In the new study, 60 enthusiasts who signed up to attend a three-month meditation retreat were randomized into two groups. The first group of 30 got to go to the Shambhala Mountain Center, a pricey hideaway in Red Feather Lakes, Colo., just south of the Wyoming state line. The other group of 30 had to wait three months to attend a second retreat at the Shambhala Center; this second group served as the study's control group. The researchers gave the two groups concentration tests before the retreat began, halfway through and then again after the sabbatical ended. During the retreats, the attendees underwent at least five hours a day of meditative practice. That's an extraordinary commitment to meditation that most of us can't relate to. (The attendees even paid $5,300 for the privilege of attending the retreats.) But while all the participants were highly willing, the strength of this new study lies in comparing their mental performance before, during and after they began meditative practice. And the results are clear: it's not wanting to meditate but actually meditating that improves your brain's performance. The participants were all asked to watch a series of lines flash on a computer screen and click a mouse when they saw a line that was shorter than the others. It was a boring test, and that was the point: in order to concentrate on those little line changes, they had to focus intently. Those who were meditating at the retreat were significantly more likely than those in the wait-list group to see increasingly small differences in the lines. Their abilities improved as meditative training continued. As the paper puts it, their powers of "visual discrimination" had appreciably increased. Which suggests that meditation can help you concentrate. But the study found that while meditators were more accurate, they were not faster: those who had meditated saw differences in the lines more often than those who hadn't, but they didn't react any faster than the control group when both saw the same line discrepancies on the screen. That's important because it suggests that meditation helps your brain do something automatic  process visual stimuli  but not something more complicated: react when it happens. I couldn't quite afford to attend the Shambhala Mountain retreat, but recently, I decided to try a small, five-minute-a-day mindfulness regimen recommended to me by the University of Washington psychology professor Marsha Linehan. One of the simple techniques Linehan uses to improve patients' mood and concentration is to ask them to sit on a park bench or at a street corner  any public place  and direct their eyes forward as strangers walk by. The idea is to avoid looking at the passersby even if they are interesting  you just let them walk by. You notice them, but you keep your mind focused on not watching them, not following them. I have been practicing this technique at New York City's congested High Line park for the past few weeks. The results have been extraordinary: I focus better at work; I don't dread cleaning after my cats as much; I actually look forward to confronting the crowds at the High Line. Past research suggests that meditation doesn't have to be intensive to have an effect. One recent study by scientists at the University of North Carolina at Charlotte found that students were able to improve their performance on tests of cognitive skill after just four days of meditation training for only 20 minutes per day. On one particularly challenging computer test of sustained attention, students who meditated did 10 times better than a control group. They also did significantly better on timed information-processing tasks that were designed to induce deadline stress. Still, meditation isn't a panacea. Recently, I got into a silly office-politics spat, and I still blow some of my deadlines. But Linehan hopes this exercise and other mindfulness practices will help patients disentangle themselves from overwhelming or burdensome thoughts  including, in some cases, suicidal thoughts. I find that I can calm myself through my short mindfulness exercise, but a few hours later, I may get just as stressed about a pointed where's-the-story e-mail from an editor. 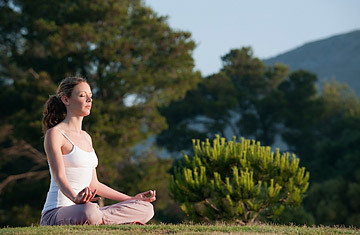 In the end, meditation may help keep your brain focused and help you absorb more information than you otherwise would. But it is not likely to help you evaluate all that extra information your brain is taking in.